Potato Chicken Pesto Kabobs are easy to put together and will be perfect for this summer on the grill. 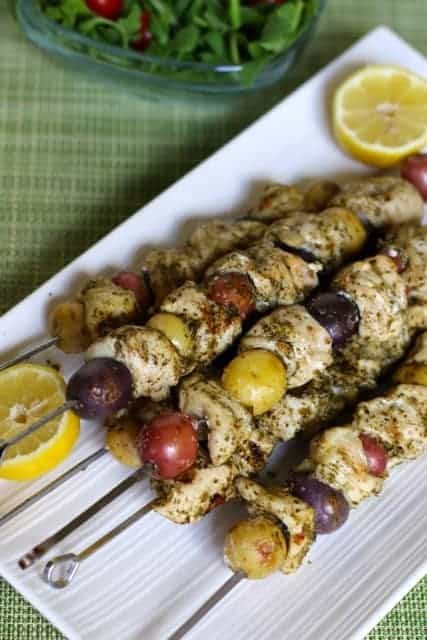 You will need some small one bite potatoes, chicken, and pesto to make this fabulous kabobs. During the summer I love to grill. It saves me from heating up the kitchen, and if I am cooking outside, that means I am not having to clean up the kitchen all night. Kabobs are a great dinner to make. These are simple to make, and they require very little preparation on your part. If you enjoy the paleo or gluten-free lifestyle, this recipe is perfect for you. You could make your own pesto sauce or you can purchase some from the grocery store. I love the garlic flavor in the pesto and it combines so well with the chicken and potatoes. 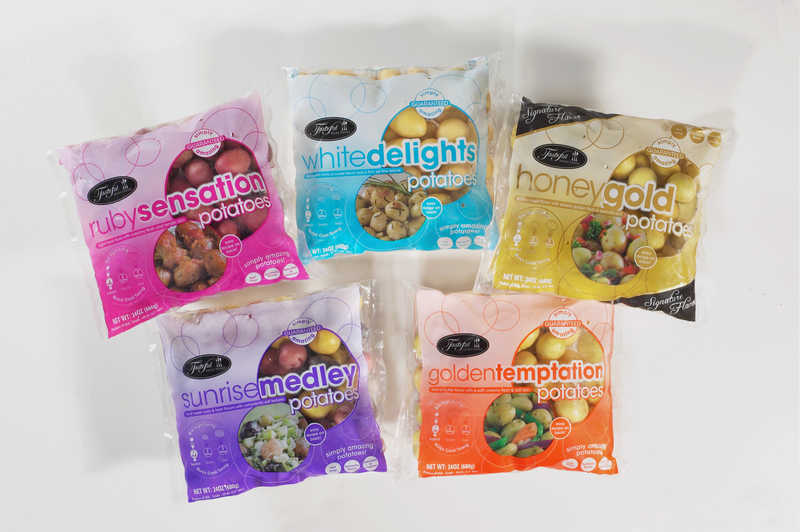 I recently had the opportunity to try these lovely potatoes from Tasteful Sections. They are baby potatoes that come in several varieties, and each variety has a unique flavor. What I really liked is that they are all small and consistently sized so they will all cook evenly. I also adore that they come prewashed so I don’t have to scrub them before I use them. These potatoes are grown all year-round in Bakersfield, CA and are available at supermarkets nationwide. I encourage you to check out their many delicious potato recipes on their blog at http://www.tastefulselections.com/recipes. If you don’t enjoy chicken you could easily substitute the chicken for beef. I would use sirloin for this. You could easily add some sliced onions or even bell peppers to these potatoes and chicken pesto kabobs. For fun, you may even want to have your whole family join you while you make these kabobs. This post is sponsored by Tasteful Selections but the opinions are my own. Preheat grill to medium-high heat. Soak wooden skewers in water while you prepare the rest of the dish. It is not necessary to soak metal skewers.Boil potatoes in water for about 7 to 8 minutes in salted water. While the potatoes are simmering cut the chicken into large 1 1/2 inch pieces. Place chicken into the bowl and stir in pesto sauce. Remove potatoes from water and drain. Place potatoes in a small bowl and drizzle 1 tablespoon of olive oil over potatoes and stir to coat the potatoes with olive oil. Assemble kabobs by placing a potato on the skewer and then alternate between chicken and potatoes until your skewer is full. Try to end the skewer with a potato, as it will keep the chicken in place. Place kabobs on the grill and cook for 10 to 15 minutes turning 1/4 turn every 2 or 3 minutes. On the last turn of the chicken squeeze the juice of 1 lemon over the kabobs. Cook chicken until it is fully cooked. Serve immediately. These kabobs go wonderful on top of a salad. Those potatoes are the perfect size for kabobs, I’m going to try this! Can’t wait to get the BBQ going this Summer! You had me at pesto!! I love how versatile this is. I’ll have to look for those potatoes – I’ve not seen them before. Pesto is a wonderful addition to so many things! Holy goodness! Perfect dinner to make without having to use the oven! Who wants to use the oven during the summer? Pesto is the magic word for me. This looks fantastic! How do you like to build up your kabobs?